Three new videos - bucket seat brackets, headliner bow clips, and 1970 SS fender emblem placement. Three videos - interior seat foam, 1966 Hood designs, and 1966 Headliners designs. Here you can view videos explaining common technical questions, how-to instructional clips, and new product demonstrations. Check back often to see what new videos have been added, and be sure to e-mail us if you have a video of your own that you would like to add, or if there is an issue you'd like to see addressed in our next video! Since 1980, Ausley's Chevelle Parts, Inc. has been supplying 1964-1972 Chevrolet Chevelle and El Camino parts for restoration. Ausley's is the largest Chevelle and El Camino ONLY parts supplier in the world. 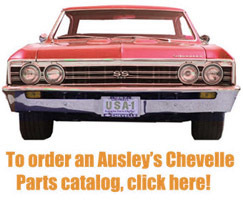 Being only a supplier of Chevrolet Chevelle and El Camino parts, Ausley's has an inventory that is second to none. Our orders are usually shipped within 24-48 hours, unless in certain times, we are shorthanded due to our commitment to car shows and swap meets around the US. Our team of qualified professionals have over 150 years of experience restoring, selling, and working on Chevelles and El Caminos. We can answer most questions you may have on your restoration process. With an unending inventory of fenders, hoods, quarter panels, radiators, bumpers, interior, weatherstripping, emblems, radios, guages, and detailing items you can be assured that when ordering from us you will receive the utmost care and professionalism that you deserve. Ausley's has been family owned and operated since 1980 and is NOT affiliated with any other parts company under any other name. Rest assured the only way to get Ausley's top quality parts and know-how is to deal with the original... Ausley's Chevelle Parts, Inc. Other companies have patterned themselves after us, but NONE of them can offer what we do: service, experience, cost, and availability. Our 1964 - 1972 Chevelle and El Camino showroom is open from 8:30-5:30 EST, Monday through Friday and 9:00-1:00 EST on Saturdays, and you are welcome to visit us during these times. Ausley's also attends between 20 and 25 car shows each year. From Daytona Beach, Florida to Englishtown, New Jersey and as far west as Nashville, TN, you can pre-order your parts and pick them up at any of the shows we have listed on our web-site under our show schedule link. Copyright © 2009 Ausley's Chevelle Parts. All rights reserved.